By “holiday stuffing,” we’re not talking about a side dish that comes with your holiday turkey – though it’s also not entirely unrelated. No, we’re talking about the common syndrome where your holiday fare is tasting so amazingly delicious that you just keep on eating, though you know you should stop. You end up paying for it with an unpleasant stuff feeling that night, a nasty weight gain a few days later one, and maybe a dollop of gastrointestinal distress in between. Weight issues are, of course, all too common these days. But even if obesity isn’t a concern for you, carrying around an extra 10 or 20 pounds has some real health consequences, leaving aside the cosmetic impact. 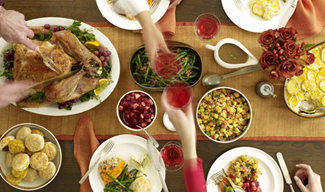 So, we all should be motivated to try and keep things under control while we’re at the holiday table. Don’t starve yourself beforehand. It might be kind of fun to arrive at a holiday feast with an enormous appetite, but skipping breakfast or lunch beforehand tends to causes us to overcompensate. After all, we tell ourselves, we haven’t had a bite all day! Better to have that bite and realize that there’s no law saying we have to sample every single thing on the table in enormous proportions. Load up on veggies. Hopefully, someone was nice enough to bring some simple and reasonably low calorie vegetable or fruit dishes or snacks. (Maybe that someone can be you!) Lining your stomach with lots of those early on can give you some resolve in avoiding overdoing the ultra-rich treats to come. Watch Your Beverages! Most of us know that sugary sodas represent one of the biggest contributors to obesity these days, but the terrifying reality is that holiday beverages – including the alcoholic adult ones – can pack an enormous caloric punch. Probably the biggest offender is egg nog. It might be delicious but, with or without the rum or brandy, one serving typically includes a whole egg, some heavy cream, and nearly a meal’s worth of calories. Beware…and try drinking some water instead. Remember what you’re there for! Yes, holiday feasting is a tradition – but the real point of the affair is to spend time with people you love, not to pointlessly stuff your face. Take a moment to really enjoy your conversation with Aunt Minnie and you might find that you don’t really need that extra serving of her French apple pie. Of course, avoiding stuffing yourself doesn’t mean you shouldn’t have as much as possible at your holiday celebrations. Just try and remind yourself that there’s nothing fun about feeling stuffed…or having to stuff yourself into your jeans a couple of days later!